The collaborators of the Bird-window Collisions Project announce the publication of their research, “Continent-wide analysis of how urbanization affects bird-window collision mortality in North America”, in the journal Biological Conservation. Click HERE for access to the paper. It is estimated that nearly 1 billion birds die annually in North America after colliding with windows in the exterior walls of buildings. Numerous bird species are affected by bird-building collisions, including species important in conservation that are declining through their ranges. Window collision risk is primarily related to the amount of windows in buildings and environmental features immediately surrounding buildings. For example, bird mortality is highest at large buildings (such as 1-3 story low-rise office buildings) with many windows and lowest at small residential structures (such as 1 story houses) with relatively few windows. Moreover, bird-window collisions are more frequent at buildings surrounded by high levels of woody and herbaceous vegetation and few paved surfaces, such as parking lots, side walks, etc., and buildings. Although building size and local environmental features are important drivers of bird-window collisions, we do not understand how collision mortality is affected by urbanization at larger spatial scales beyond just one building and the habitat structure right around it. We know that bird community structure (e.g., numbers and types of birds) and bird behavior (e.g., habitat selection and learning) are influenced by regional-scale urbanization, which could in turn drive risk of bird mortality resulting from window collisions. In autumn 2014, an international team of more than 60 researchers led by Professors Stephen B. Hager (Augustana College, Rock Island, IL, USA) and Bradley J. Cosentino (Hobart and William Smith Colleges, Geneva, NY, USA), and organized through the Ecological Research as Education Network, studied how local-scale building features and land cover and large-scale urbanization together affect continent-wide differences in bird-window collision mortality. To do this, they monitored nearly 300 buildings that differed in size and local land cover types for bird-window collision mortality at 40 college and university campuses in North America. To make the data comparable among sites, the researchers developed and used a standardized monitoring protocol so that field crews searched for and documented bird mortality in the same way. The researchers documented 324 bird carcasses in autumn 2014, with an average of 8.1 carcasses per site and a range of 0-34 carcasses per site. 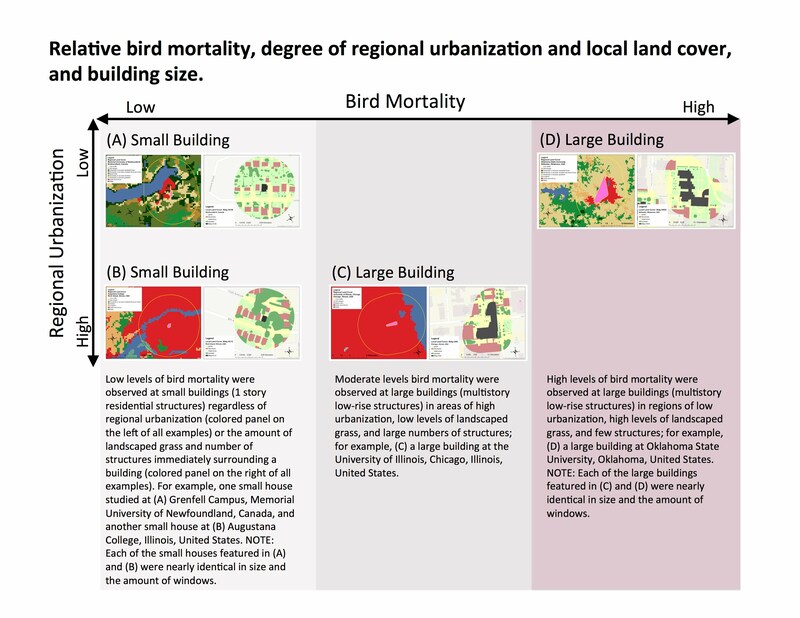 Moreover, they found that building size had a strong positive effect on bird-window collision mortality, but the strength of this effect depended on the degree of urbanization at the regional scale (see figure below). The positive relationship between bird mortality and building size was greatest in regions of low urbanization containing locally extensive landscaped grass and few structures (i.e., ‘rural’ landscapes). Collision mortality was low to nonexistent in regions that were highly urbanized and contained little landscaped grass and many buildings. What may be causing these patterns of bird-window collision mortality? The researchers think it may be related to how birds select habitats during migration and the differences in bird behavior between urban and rural populations. Habitat selection in migratory birds occurs in an ordered fashion starting at broad scales and then narrowing their selection based on small-scale features. This ordered selection process would ultimately place birds in close proximity to buildings and at risk of fatal collisions with windows. At regional scales, migrating birds select among numerous widely spaced habitat types using geophysical (rivers, mountains, celestial, and magnetic), meteorological (weather), and social (flight calls among members of the same species) cues and experience. For example, forest-adapted birds often select rural habitats (e.g., open and low-intensity developed spaces containing high levels of lawn grasses, some structures, and low levels of impervious surfaces) over other available habitats, such as areas of high urbanization. In addition to the cues birds use in selecting rural areas during migration, data from studies using the technology of weather RADAR stations to visualize bird migration in near-real time suggest that migrating birds are negatively influenced during the nighttime by broad scale city glow wherein birds become entrapped by artificial light. The researchers reasoned that regional lighting patterns should be associated with urbanization, and light radiating from low-rise and large buildings within regional of low urbanization may be more of an attractant compared to similar sized buildings in a highly urbanized landscape. The researchers referred to this as a ‘large-scale beacon effect’, which would cause birds and collisions to be more diluted among large buildings in urban areas (resulting in less of an effect of building size) than in rural areas (resulting in more of an effect of building size). Following habitat selection at regional scales, collision risk would be influenced at the local scale by the manner in which birds use habitats during a given day. At the local scale, migratory birds engage in relatively short-distance exploratory forays in search of food and shelter. One such foray is known as ‘morning flight’, which occurs within 2 hours after sunrise when migrants move throughout the landscape above tree height in search of preferred or higher quality habitats. After ‘morning flight’ bird movements in the afternoon becoming localized and restricted to short-distance foraging bouts. Thus, window collision risk would be relatively high for birds flying above tree height during morning flight since they would be exposed to windows at this height in low-rise and tall buildings, and collision risk should be magnified in rural areas containing proportionately more migrants, in terms of numbers and types of birds, than in urban areas. Fewer birds flying below tree height during morning flight would result in lower collision risk at windows close to ground level, such as those in houses (1-3 stories in height), regardless of the degree of urbanization. An alternative (though still somewhat related) explanation for the influence of regional urbanization on collision mortality is divergence in bird behavior between urban and rural populations. Behavioral divergence between urban and rural landscapes may occur from birds learning from non-fatal strikes based on previous experience and gaining new anti-collision behaviors that allow birds to avoid colliding with windows. For example, birds in urban areas live among numerous buildings, which would offer more opportunities for hitting windows than in rural areas and subsequently more learning from those window strikes than birds in rural areas. Previous research suggests that the relatively large brain size in birds makes them primed for learning. Juvenile birds are reported to suffer higher rates of collision mortality than adults. For those urban-dwelling juveniles that do not die, learning may occur early in development, which could alter nervous system functioning that controls flight behaviors to avoid windows later in life. Aside from learning, individuals in urban populations may simply move less or shorter distances across the environment due to highly localized and abundant food sources (i.e., fruiting trees, feeders). If urban individuals move less, the probability of striking windows may be reduced. Birds may be evolving differences in behavior between urban and rural bird populations that lead to unequal rates of collision mortality. For example, variation in the ability of migratory birds to see and avoid windows may exist between populations. This variation would be expected to result in proportionately lower collision mortality in urban birds during migration. What are the conservation implications of all this? The results of this research allow for a better appreciation for why up to 1 billion birds die annually throughout North America after hitting windows in buildings. The regional-scale beacon effect hypothesized by the researchers in rural landscapes suggests the potential benefit of implementing lights out programs (e.g., National Audubon Society’s Lights Out program) in cities and towns of all sizes, not just in large cities characterized by high-intensity urbanization. At local scales, collision mortality can be reduced or eliminated by constructing buildings with a small amount of sheet glass, and retrofitting windows in existing buildings with frit patterns on glass surfaces, which may make windows visible to birds. More research is needed to understand the finer details for why so many birds in North America, and indeed throughout the world, collide with sheet glass in the exterior of buildings. Future studies should: (a) assess bird-window collisions at sites other than college/university campuses, and in building types that were not well-sampled in the study, e.g., convention centers, stadiums, extremely tall and abnormally-shaped buildings with exterior walls composed almost entirely of sheet glass, etc. ; (b) evaluate the role of urbanization in bird-window collisions in other seasons, such as winter, spring, and summer; and (c) account for human-related sources of mortality, such as bird-window collisions, in assessments of the population health of vulnerable species.